- også deler som ikke er listet - selv om de blir solgt etterhvert. finne tak i det du trenger. Stort utvalg i NYE ekshaustdeler for Jaguar/Daimler XJ Serie I-II-III. Kvalitetsekshaust. Interiørdeler i Beige i meget fin stand; dørsider, konsoll, dash-pad mmm. Samlet eller bit for bit. Diverse undermatter, støydemping med mer. NB: At hjulene ikke strykes når de er solgt betyr bare at nye kan skaffes på bestilling. Profesjonell farving av skinn interiør. Alle farver! en del som ikke lenger kan skaffes i rett farve? Henvend deg til meg for farving av både skinn og vinyl. Jeg bruker Connolly farveprodukter for varig kvalitet! Kan også levere sett med farve for de som vil farve selv. www.johnscars.com Jaguar conversions, swaps, parts, service and advice - from John's Cars in Dallas. www.hearnehardwoods.com/index.html Treets mange hemmeligheter - les om hvor Jaguar får sitt treverk fra! If your car is fitted with an OPUS ignition amplifier, it WILL leave you stranded... any day now ! Even if you've "upgraded", have you got the BEST ignition solution for your V12 engine? ...without changing the original appearance or location! ReOpus is a totally new amplifier circuit board that is easily fitted inside your existing Lucas OPUS AB3 amplifier casing. ReOpus has been specifically designed and manufactured to dramatically improve on the original's performance and specification. ReOpus transforms your inevitably degraded and outdated Lucas ignition amplifier into a modern, high-performance, and thoroughly reliable system for your cherished V12. Often, the first time you know there's a problem is when your engine dies suddenly in the middle of the road leaving you stranded. Opening the bonnet and letting everything cool down for half an hour allows you to restart and drive on - until it heats up again a few minutes later. Common warning symptoms also include difficulty in starting a warm or hot engine. The original Lucas OPUS AB3 ignition amplifier is well known for being the main failure point of the ignition system fitted to Jaguar V12 and other high performance vehicles of the era. The OPUS amplifier PC (Printed Circuit) board is housed in a finned aluminium case. This was initally located between the cylinder heads where it is subject to extreme heat. This was necessary because the leads needed to be as short as possible to avoid interference. Later modifications allowed Lucas to lengthen the leads and the amplifier was moved to a cooler location near the radiator. This only marginally improved its reliability. First designed in the 1960's, the OPUS ignition system was a very elegant solution to cope with the incredibly rapid firing requirement of high revving 12 cylinder engines. The problem lies in the fact that the OPUS designers had a limited number of comparatively primitive electronic components to work with. Forty years on, and there are now many high-grade components available specifically designed for vehicle electronics. The poor quality of components and the extreme conditions under which it operates, mean that the OPUS amplifier has been the source of great frustration for owners over the years - especially when a replacement would soon go the same way. The borderline performance is made worse by the ageing of the electronics and the build-up of the heating/cooling cycles as you drive. For this reason, some of the original electronic components will have changed in their values and the unit will be operating outside its designed limits. The results are an irregular and weak spark with as much as 12 degree timing errors between cylinders. If your vehicle still has a Lucas OPUS unit, it will be contributing to poor starting, irregular idling, reduced performance and poor fuel economy... and one day soon, it will fail. Ever heard of Murphy's Law? The bad reputation of the OPUS system, has been created solely by the failures of the amplifier circuit board. People have questioned the reliability of the magnetic pick up and timing wheel in the distributor. In our experience, these are very simple, reliable and effective devices, probably more so than optical devices. For years, the team at ReOpus looked high and low for other solutions. We found one that replaces the amplifier internals with a later (1980's) Lucas CEI design. It's expensive because it also requires a brand new distributor, pick up, and coil... time and money wasted if the originals are still working. Also, we weren't convinced this would solve the high operating temperature problems... and feedback tells us we may have been right. If you're not concerned about originality, we found other aftermarket "black box" systems. Our own experiences, and others, revealed many having problems with system compatibility, reliability, component quality, ease of fitting, service and support from the manufacturers. Check their specifications for yourself... Can they cope with 12 cylinders @ 8,000rpm? Do they actually state they are designed to run 12 cylinders - or do they only quote 8cyl specs? They may provide a V12 fitting kit, but is this just a corporate way of selling more of their generic amplifier units? Our research on the original Lucas OPUS shows that the only significant upgrade was to adjust the circuitry to allow lengthening of the leads for a cooler location in the engine compartment. None of the above are truly "modern technology " designs. ReOpus was designed with the latest components specifically to run 12 cylinders accurately - even from the engine valley heat of a V12! Think of it this way: In the V12, the ignition has to work 3 times faster than a 4 cylinder, 2 times faster than a 6 cylinder, and 50% faster than an 8 cylinder. It makes sense to go with a system that was designed to run 12 cylinders up to 8,000rpm rather than a generic, or "adapted" amplifier still using dated electronics and circuitry. Uses existing casing and wiring = original appearance. Dramatic performance improvement over original. Voltage regulated for precision timing between all 12 cylinders. Item 4 above means smoother, quieter running at all engine speeds. Cooler running engine due to better fuel burn. Temperature compensation system - V12 engine heat is no problem! Eliminates the temperature related timing scatter problems of the original unit. Works in harmony with the rest of the system. Uses existing pickup, coil and ballast. Latest Hybrid transistors specifically designed for firing coils. More flexibility with coil choice. Latest Hi-Spec components give better hot and cold starting. Accurately fires all V12 cylinders up to 8,000rpm - V8/V10 applications reach proportionately higher rpm. Specifically re-designed and manufactured to far exceed original requirements. Ruggedly built using smaller and lighter modern electronic components on a double-sided board. On board diagnostic led system. 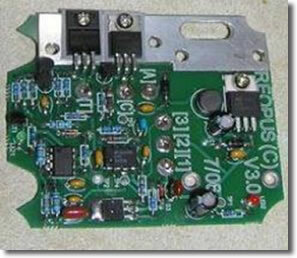 ReOpus gives you all these benefits by just replacing the old circuit board in your existing amplifier casing. This can often be achieved without completely removing the amplifier from the vehicle (if using a portable soldering iron) and even without resetting the ignition timing. ReOpus is easily installed by anyone who can use a screwdriver, spanner and a small soldering iron. If you don't feel up to soldering (hey, no shame in that! ), any auto-electrician should be able to do the job in less than an hour! If you want to check your auto-electrician will do the job, just print out the the "Fitting Instructions" page and show them... or email them a link to the page. You could save money by unplugging and removing the amplifier case and take it to a competent electrician to do the soldering bit. Just wanted to let the members know about the improvement that fitting one of the Dave Curry REOPUS units has made to my 1973 V12E. I can confirm that all the claims made by REOPUS Engineering have also been my experience... I have owned my car for coming up 20 years & travelled extensive mileages so the cars performance prior to fitting the new unit is well known to me... Fuel consumption improved by 9% and overall the engine performance improved. The standing quarter down from 15.79 to 15.40 and overall drivability significantly improved. So I can recommend the unit. Just to make it clear I do not know Dave Curry and we have never met. We had three V12 engined cars on the team - all had Opus ignition problems. We tried the various fixes available at the time, but weren't happy with them. Dave (the board's designer), decided to do something about it. He created his totally new ReOpus design and fitted it to his V12 E-type. The difference was dramatic! It was so good that the decision was made to manufacture and distribute it world wide. After extensive prototype testing and adding further improvements, ReOpus must now be the best solution whichever way you look at it - and surely you want to fit the best? We're so confident with ReOpus that we're giving you a manufacturer's FIVE YEAR GUARANTEE... plus personal ongoing email, web site, and manufacturer support.